“We believe that anyone can dance if they are disciplined, well trained and open to a variety of concepts. Eligible dance artists will have completed high school, and it is recommended they attend the 2019 International Dance Experience, the summer intensive of the Ruth Page School of Dance, June 24 - July 19. The Ruth Page Civic Ballet will provide continued comprehensive technique training, unique performance experiences, focused study with guest artists and choreographers, and travel to our International Sister Schools in Cuba, Italy and Spain. A commitment for the full year is expected. Co-founded in 1998 by Larry and Dolores Long, the Civic Ballet of Chicago (now the Ruth Page Civic Ballet), was established to continue developing serious young dancers aged 17-22 with advanced training and performance experience as a prelude to a professional career in ballet. It is today the official training company of The Ruth Page School of Dance and one of the Center's Artists In-Residence. Dancers are invited to take part in the Civic by it’s artistic director, Victor Alexander, who will guide and mentor each aspiring young artist during the one to two year program. The mission of the Ruth Page Civic Ballet is to identify, nurture and mentor emerging dance artists from around the world through enhanced performance opportunities within an elite training company. Serving as a bridge between training and professional performance, company members will refine their ballet and contemporary techniques in an international environment of performers and educators before moving on to professional careers in dance. The Civic's dancers are joined in performances by notable guest artists and choreographers, expanding their sphere of professional work. 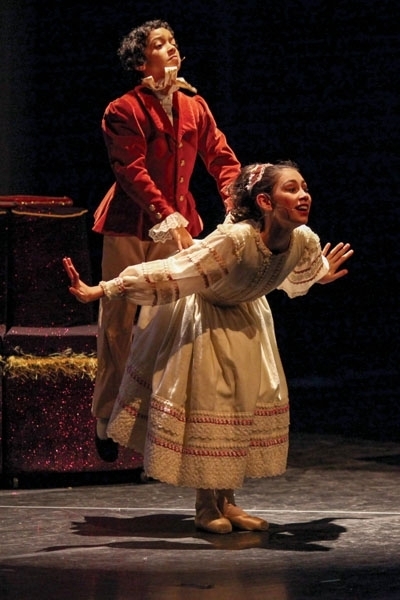 Central to the Civic's performance schedule is the annual presentation of "The Nutcracker," the popular recreation of the beloved holiday classic. Originally presented in the Arie Crown Theatre from 1965 to 1997, the Ruth Page Civic Ballet performances recreates Ruth Page's beloved original full-length staging. Exquisite dancing, stunning costumes and magical settings in the Land of Snow and the Kingdom of the Sweets, "The Nutcracker" promises world-class entertainment and holiday joy for children of all ages. Full of beauty... The lovingly sculpted "Scenes" glides with lilting propulsion and sports a bright variety of classical technique.